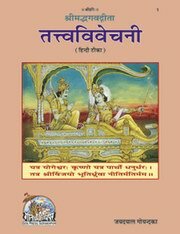 A magnificent commentary on Gita the song celestial by Brahmalina Sri Jaydayal Goyandka the founder of Gita Press with a view to propagate the divine preachings of Lord Krishna to each and every person. Gita; the song celestial, has emanated from the lotus-like lips of the Lord himself. As a book of scripture, the Bhagavadgita has assumed a position of universal interest. The commentary consists of 2515 questions and answers thereof. The descriptive explanation of Slokas of Gita full of its deepest mystery has been given in a language so sweet and simple. By studying it carefully even ordinary persons may be able to understand easily the deepest mystery of the Gita. By holding its essence into their heart they can make their lives meaningful.